The Concrete MD can be powered from the hydraulics on your tractor when used as an attachment. 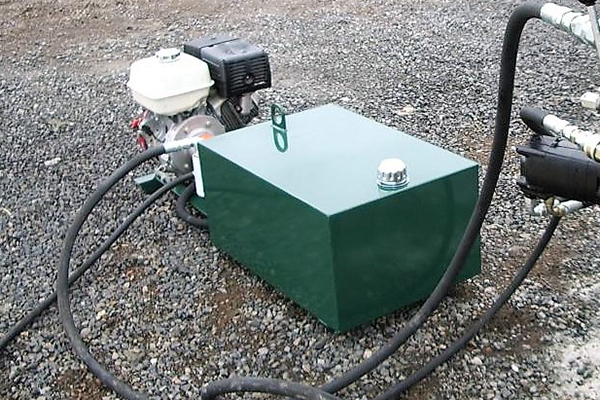 When the MD is used to mix concrete or block mix in remote locations, however, a power pack is necessary. A hydraulic pump powered by a gasoline engine provides the fluid power to run the MD. The 10GPM system comes with a bypass switch for safety and a filter to keep the fluid clean. It’s small compact size allows it to be housed inside the MD hopper for shipping. If you are considering a Concrete MD for remote location work, this power pack will be what you need.